In this tutorial, you will learn how to use OpenCV to perform face recognition. 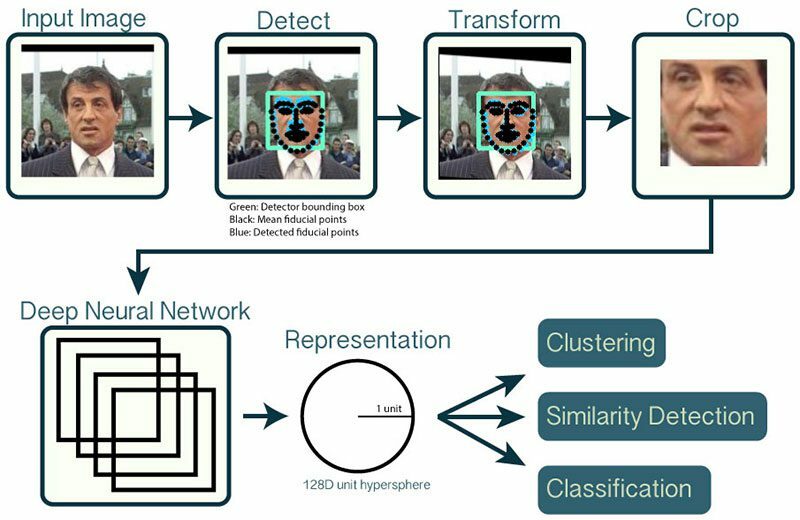 To build our face recognition system, we’ll first perform face detection, extract face embeddings from each face using deep learning, train a face recognition model on the embeddings, and then finally recognize faces in both images and video streams with OpenCV. Today’s tutorial is also a special gift for my fiancée, Trisha (who is now officially my wife). Our wedding was over the weekend, and by the time you’re reading this blog post, we’ll be at the airport preparing to board our flight for the honeymoon. To celebrate the occasion, and show her how much her support of myself, the PyImageSearch blog, and the PyImageSearch community means to me, I decided to use OpenCV to perform face recognition on a dataset of our faces. You can swap in your own dataset of faces of course! All you need to do is follow my directory structure in insert your own face images. As a bonus, I’ve also included how to label “unknown” faces that cannot be classified with sufficient confidence. 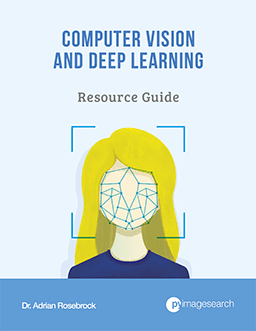 To learn how to perform OpenCV face recognition, just keep reading! In today’s tutorial, you will learn how to perform face recognition using the OpenCV library. You might be wondering how this tutorial is different from the one I wrote a few months back on face recognition with dlib? While we used OpenCV to facilitate face recognition, OpenCV itself was not responsible for identifying faces. All of these tasks will be accomplished with OpenCV, enabling us to obtain a “pure” OpenCV face recognition pipeline. I’ve discussed how OpenCV’s face detection works previously, so please refer to it if you have not detected faces before. The model responsible for actually quantifying each face in an image is from the OpenFace project, a Python and Torch implementation of face recognition with deep learning. This implementation comes from Schroff et al.’s 2015 CVPR publication, FaceNet: A Unified Embedding for Face Recognition and Clustering. Reviewing the entire FaceNet implementation is outside the scope of this tutorial, but the gist of the pipeline can be seen in Figure 1 above. First, we input an image or video frame to our face recognition pipeline. Given the input image, we apply face detection to detect the location of a face in the image. Optionally we can compute facial landmarks, enabling us to preprocess and align the face. Face alignment, as the name suggests, is the process of (1) identifying the geometric structure of the faces and (2) attempting to obtain a canonical alignment of the face based on translation, rotation, and scale. While optional, face alignment has been demonstrated to increase face recognition accuracy in some pipelines. Figure 2: How the deep learning face recognition model computes the face embedding. The FaceNet deep learning model computes a 128-d embedding that quantifies the face itself. But how does the network actually compute the face embedding? The anchor is our current face and has identity A. The second image is our positive image — this image also contains a face of person A. The negative image, on the other hand, does not have the same identity, and could belong to person B, C, or even Y! The point is that the anchor and positive image both belong to the same person/face while the negative image does not contain the same face. In this manner, the network is able to learn to quantify faces and return highly robust and discriminating embeddings suitable for face recognition. And furthermore, we can actually reuse the OpenFace model for our own applications without having to explicitly train it! Even though the deep learning model we’re using today has (very likely) never seen the faces we’re about to pass through it, the model will still be able to compute embeddings for each face — ideally, these face embeddings will be sufficiently different such that we can train a “standard” machine learning classifier (SVM, SGD classifier, Random Forest, etc.) on top of the face embeddings, and therefore obtain our OpenCV face recognition pipeline. If you are interested in learning more about the details surrounding triplet loss and how it can be used to train a face embedding model, be sure to refer to my previous blog post as well as the Schroff et al. publication. Figure 3: A small example face dataset for face recognition with OpenCV. “Unknown”, which is used to represent faces of people we do not know and wish to label as such (here I just sampled faces from the movie Jurassic Park which I used in a previous post — you may want to insert your own “unknown” dataset). As I mentioned in the introduction to today’s face recognition post, I was just married over the weekend, so this post is a “gift” to my new wife ?. Each class contains a total of six images. If you are building your own face recognition dataset, ideally, I would suggest having 10-20 images per person you wish to recognize — be sure to refer to the “Drawbacks, limitations, and how to obtain higher face recognition accuracy” section of this blog post for more details. Once you’ve grabbed the zip from the “Downloads” section of this post, go ahead and unzip the archive and navigate into the directory. There are quite a few moving parts for this project — take the time now to carefully read this section so you become familiar with all the files in today’s project. 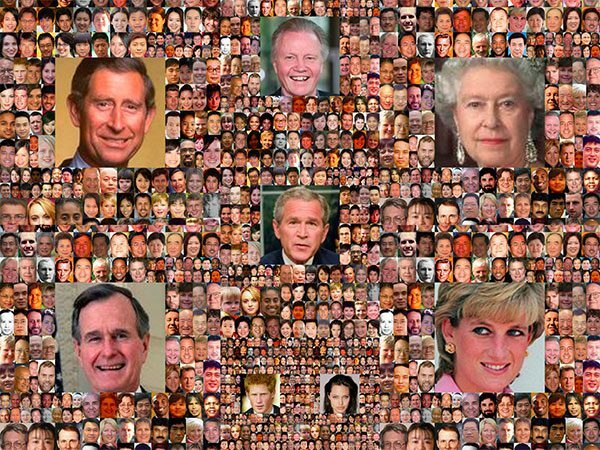 dataset/ : Contains our face images organized into subfolders by name. images/ : Contains three test images that we’ll use to verify the operation of our model. face_detection_model/ : Contains a pre-trained Caffe deep learning model provided by OpenCV to detect faces. This model detects and localizes faces in an image. embeddings.pickle : A serialized facial embeddings file. Embeddings have been computed for every face in the dataset and are stored in this file. le.pickle : Our label encoder. Contains the name labels for the people that our model can recognize. recognizer.pickle : Our Linear Support Vector Machine (SVM) model. This is a machine learning model rather than a deep learning model and it is responsible for actually recognizing faces. extract_embeddings.py : We’ll review this file in Step #1 which is responsible for using a deep learning feature extractor to generate a 128-D vector describing a face. All faces in our dataset will be passed through the neural network to generate embeddings. openface_nn4.small2.v1.t7 : A Torch deep learning model which produces the 128-D facial embeddings. We’ll be using this deep learning model in Steps #1, #2, and #3 as well as the Bonus section. train_model.py : Our Linear SVM model will be trained by this script in Step #2. We’ll detect faces, extract embeddings, and fit our SVM model to the embeddings data. recognize.py : In Step #3 and we’ll recognize faces in images. We’ll detect faces, extract embeddings, and query our SVM model to determine who is in an image. We’ll draw boxes around faces and annotate each box with a name. recognize_video.py : Our Bonus section describes how to recognize who is in frames of a video stream just as we did in Step #3 on static images. Let’s move on to the first step! Now that we understand how face recognition works and reviewed our project structure, let’s get started building our OpenCV face recognition pipeline. --dataset : The path to our input dataset of face images. --embeddings : The path to our output embeddings file. Our script will compute face embeddings which we’ll serialize to disk. 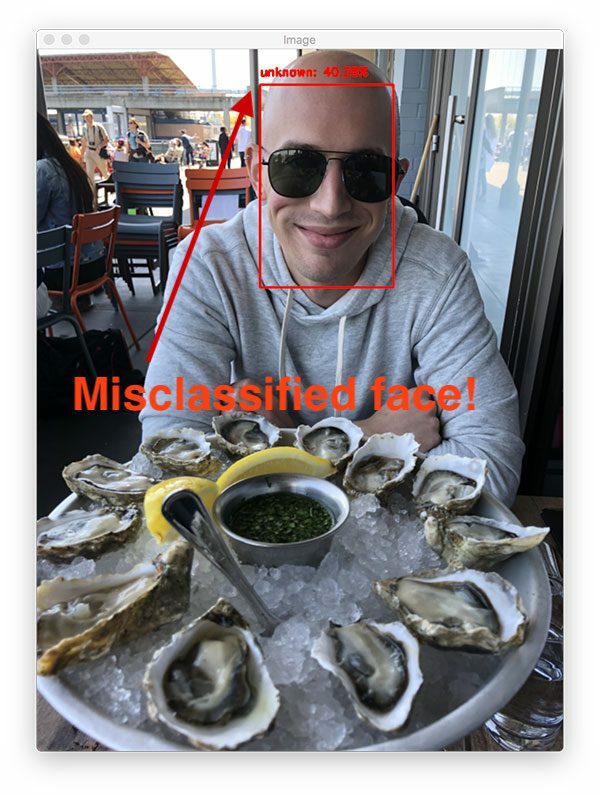 --detector : Path to OpenCV’s Caffe-based deep learning face detector used to actually localize the faces in the images. --embedding-model : Path to the OpenCV deep learning Torch embedding model. This model will allow us to extract a 128-D facial embedding vector. --confidence : Optional threshold for filtering week face detections. detector : Loaded via Lines 26-29. We’re using a Caffe based DL face detector to localize faces in an image. embedder : Loaded on Line 33. This model is Torch-based and is responsible for extracting facial embeddings via deep learning feature extraction. Notice that we’re using the respective cv2.dnn functions to load the two separate models. The dnn module wasn’t made available like this until OpenCV 3.3, but I recommend that you are using OpenCV 3.4.2 or higher for this blog post. The imagePaths list, built on Line 37, contains the path to each image in the dataset. I’ve made this easy via my imutils function, paths.list_images . Our embeddings and corresponding names will be held in two lists: knownEmbeddings and knownNames (Lines 41 and 42). We’ll also be keeping track of how many faces we’ve processed via a variable called total (Line 45). We begin looping over imagePaths on Line 48. Notice how by using imagePath.split and providing the split character (the OS path separator — “/” on unix and “\” on Windows), the function produces a list of folder/file names (strings) which walk down the directory tree. We grab the second-to-last index, the persons name , which in this case is 'adrian' . Finally, we wrap up the above code block by loading the image and resize it to a known width (Lines 57 and 58). On Lines 62-64, we construct a blob. To learn more about this process, please read Deep learning: How OpenCV’s blobFromImage works. From there we detect faces in the image by passing the imageBlob through the detector network (Lines 68 and 69). The detections list contains probabilities and coordinates to localize faces in an image. Assuming we have at least one detection, we’ll proceed into the body of the if-statement (Line 72). We make the assumption that there is only one face in the image, so we extract the detection with the highest confidence and check to make sure that the confidence meets the minimum probability threshold used to filter out weak detections (Lines 75-81). Assuming we’ve met that threshold, we extract the face ROI and grab/check dimensions to make sure the face ROI is sufficiently large (Lines 84-93). We construct another blob, this time from the face ROI (not the whole image as we did before) on Lines 98 and 99. Subsequently, we pass the faceBlob through the embedder CNN (Lines 100 and 101). This generates a 128-D vector ( vec ) which describes the face. We’ll leverage this data to recognize new faces via machine learning. And then we simply add the name and embedding vec to knownNames and knownEmbeddings , respectively (Lines 105 and 106). We also can’t forget about the variable we set to track the total number of faces either — we go ahead and increment the value on Line 107. We continue this process of looping over images, detecting faces, and extracting face embeddings for each and every image in our dataset. We add the name and embedding data to a dictionary and then serialize the data in a pickle file on Lines 110-114. At this point we’re ready to extract embeddings by running our script. 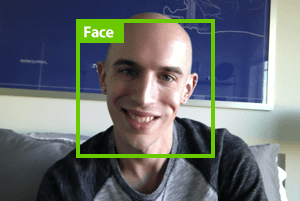 To follow along with this face recognition tutorial, use the “Downloads” section of the post to download the source code, OpenCV models, and example face recognition dataset. Here you can see that we have extracted 18 face embeddings, one for each of the images (6 per class) in our input face dataset. At this point we have extracted 128-d embeddings for each face — but how do we actually recognize a person based on these embeddings? The answer is that we need to train a “standard” machine learning model (such as an SVM, k-NN classifier, Random Forest, etc.) on top of the embeddings. In my previous face recognition tutorial we discovered how a modified version of k-NN can be used for face recognition on 128-d embeddings created via the dlib and face_recognition libraries. Today, I want to share how we can build a more powerful classifier on top of the embeddings — you’ll be able to use this same method in your dlib-based face recognition pipelines as well if you are so inclined. We import our packages and modules on Lines 2-5. We’ll be using scikit-learn’s implementation of Support Vector Machines (SVM), a common machine learning model. --embeddings : The path to the serialized embeddings (we exported it by running the previous extract_embeddings.py script). --recognizer : This will be our output model that recognizes faces. It is based on SVM. We’ll be saving it so we can use it in the next two recognition scripts. --le : Our label encoder output file path. We’ll serialize our label encoder to disk so that we can use it and the recognizer model in our image/video face recognition scripts. Each of these arguments is required. Here we load our embeddings from Step #1 on Line 19. We won’t be generating any embeddings in this model training script — we’ll use the embeddings previously generated and serialized. Then we initialize our scikit-learn LabelEncoder and encode our name labels (Lines 23 and 24). On Line 29 we initialize our SVM model, and on Line 30 we fit the model (also known as “training the model”). Here we are using a Linear Support Vector Machine (SVM) but you can try experimenting with other machine learning models if you so wish. After training the model we output the model and label encoder to disk as pickle files. We write two pickle files to disk in this block — the face recognizer model and the label encoder. At this point, be sure you executed the code from Step #1 first. You can grab the zip containing the code and data from the “Downloads” section. Here you can see that our SVM has been trained on the embeddings and both the (1) SVM itself and (2) the label encoding have been written to disk, enabling us to apply them to input images and video. We are now ready to perform face recognition with OpenCV! We’ll start with recognizing faces in images in this section and then move on to recognizing faces in video streams in the following section. We import our required packages on Lines 2-7. At this point, you should have each of these packages installed. --image : The path to the input image. We will attempt to recognize the faces in this image. --detector : The path to OpenCV’s deep learning face detector. We’ll use this model to detect where in the image the face ROIs are. --embedding-model : The path to OpenCV’s deep learning face embedding model. We’ll use this model to extract the 128-D face embedding from the face ROI — we’ll feed the data into the recognizer. --recognizer : The path to our recognizer model. We trained our SVM recognizer in Step #2. This is what will actually determine who a face is. --le : The path to our label encoder. This contains our face labels such as 'adrian' or 'trisha' . --confidence : The optional threshold to filter weak face detections. Be sure to study these command line arguments — it is important to know the difference between the two deep learning models and the SVM model. If you find yourself confused later in this script, you should refer back to here. detector : A pre-trained Caffe DL model to detect where in the image the faces are (Lines 27-30). embedder : A pre-trained Torch DL model to calculate our 128-D face embeddings (Line 34). recognizer : Our Linear SVM face recognition model (Line 37). We trained this model in Step 2. Both 1 & 2 are pre-trained meaning that they are provided to you as-is by OpenCV. They are buried in the OpenCV project on GitHub, but I’ve included them for your convenience in the “Downloads” section of today’s post. I’ve also numbered the models in the order that we’ll apply them to recognize faces with OpenCV. We also load our label encoder which holds the names of the people our model can recognize (Line 38). Load the image into memory and construct a blob (Lines 42-49). Learn about cv2.dnn.blobFromImage here. Localize faces in the image via our detector (Lines 53 and 54). We loop over the detections on Line 57 and extract the confidence of each on Line 60. Then we compare the confidence to the minimum probability detection threshold contained in our command line args dictionary, ensuring that the computed probability is larger than the minimum probability (Line 63). From there, we extract the face ROI (Lines 66-70) as well as ensure it’s spatial dimensions are sufficiently large (Lines 74 and 75). Then, we pass the vec through our SVM recognizer model (Line 86), the result of which is our predictions for who is in the face ROI. We take the highest probability index (Line 87) and query our label encoder to find the name (Line 89). In between, I extract the probability on Line 88. Note: You cam further filter out weak face recognitions by applying an additional threshold test on the probability. For example, inserting if proba < T (where T is a variable you define) can provide an additional layer of filtering to ensure there are less false-positive face recognitions. We construct a text string containing the name and probability on Line 93. And then we draw a rectangle around the face and place the text above the box (Lines 94-98). And then finally we visualize the results on the screen until a key is pressed (Lines 101 and 102). It is time to recognize faces in images with OpenCV! To apply our OpenCV face recognition pipeline to my provided images (or your own dataset + test images), make sure you use the “Downloads” section of the blog post to download the code, trained models, and example images. 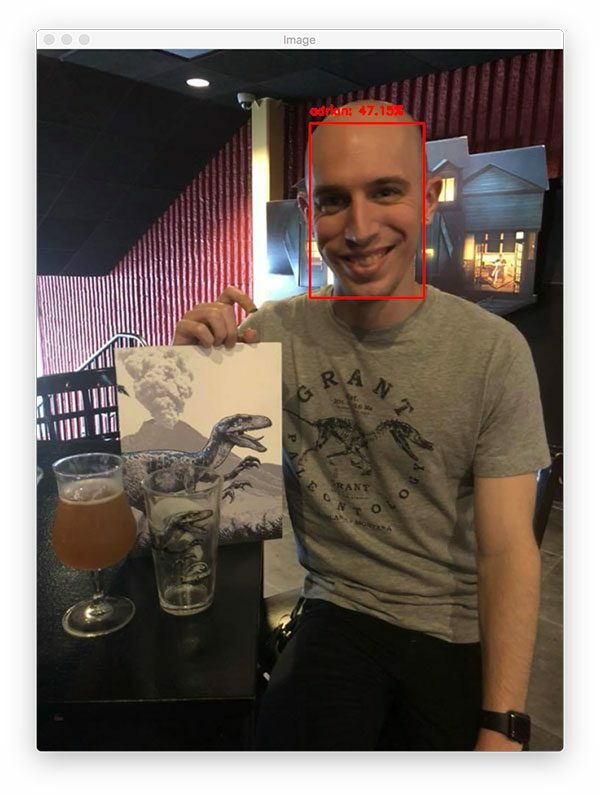 Figure 4: OpenCV face recognition has recognized me at the Jurassic World: Fallen Kingdom movie showing. Here you can see me sipping on a beer and sporting one of my favorite Jurassic Park shirts, along with a special Jurassic World pint glass and commemorative book. My face prediction only has 47.15% confidence; however, that confidence is higher than the “Unknown” class. 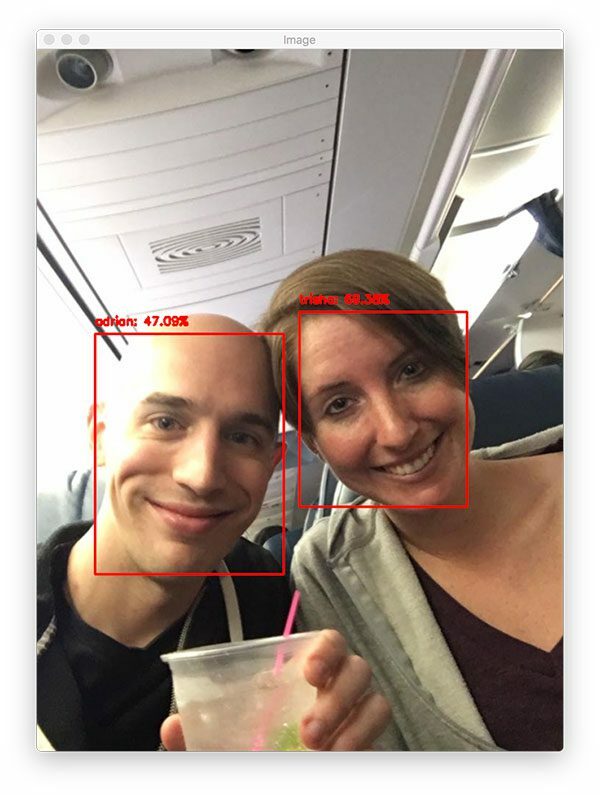 Figure 5: My wife, Trisha, and I are recognized in a selfie picture on an airplane with OpenCV + deep learning facial recognition. Here are Trisha and I, ready to start our vacation! Figure 6: Facial recognition with OpenCV has determined that this person is “unknown”. The third image is an example of an “unknown” person who is actually Patrick Bateman from American Psycho — believe me, this is not a person you would want to see show up in your images or video streams! As a bonus, I decided to include a section dedicated to OpenCV face recognition in video streams! The actual pipeline itself is near identical to recognizing faces in images, with only a few updates which we’ll review along the way. Our imports are the same as the Step #3 section above, except for Lines 2 and 3 where we use the imutils.video module. We’ll use VideoStream to capture frames from our camera and FPS to calculate frames per second statistics. The command line arguments are also the same except we aren’t passing a path to a static image via the command line. Rather, we’ll grab a reference to our webcam and then process the video. Refer to Step #3 if you need to review the arguments. Here we load face detector , face embedder model, face recognizer model (Linear SVM), and label encoder. Again, be sure to refer to Step #3 if you are confused about the three models or label encoder. Our VideoStream object is initialized and started on Line 43. We wait for the camera sensor to warm up on Line 44. We also initialize our frames per second counter (Line 47) and begin looping over frames on Line 50. We grab a frame from the webcam on Line 52. From here everything is the same as Step 3. We resize the frame (Line 57) and then we construct a blob from the frame + detect where the faces are (Lines 61-68). Just as in the previous section, we begin looping over detections and filter out weak ones (Lines 71-77). Then we extract the face ROI as well as ensure the spatial dimensions are sufficiently large enough for the next steps (Lines 84-89). Construct the faceBlob (Lines 94 and 95) and calculate the facial embeddings via deep learning (Lines 96 and 97). Recognize the most-likely name of the face while calculating the probability (Line 100-103). Draw a bounding box around the face and the person’s name + probability (Lines 107 -112). Our fps counter is updated on Line 115. Display the annotated frame (Line 118) and wait for the “q” key to be pressed at which point we break out of the loop (Lines 119-123). Stop our fps counter and print statistics in the terminal (Lines 126-128). Cleanup by closing windows and releasing pointers (Lines 131 and 132). Figure 7: Face recognition in video with OpenCV. As you can see, both Trisha and my face are correctly identified! Our OpenCV face recognition pipeline is also obtaining ~16 FPS on my iMac. On my MacBook Pro I was getting ~14 FPS throughput rate. Figure 8: All face recognition systems are error-prone. There will never be a 100% accurate face recognition system. Inevitably, you’ll run into a situation where OpenCV does not recognize a face correctly. My first suggestion is likely the most obvious one, but it’s worth sharing. Them: Hey Adrian, I am trying to perform face recognition on a dataset of my classmate’s faces, but the accuracy is really low. What can I do to increase face recognition accuracy? Me: How many face images do you have per person? Them: Only one or two. I get the impression that most readers already know they need more face images when they only have one or two example faces per person, but I suspect they are hoping for me to pull a computer vision technique out of my bag of tips and tricks to solve the problem. If you find yourself with low face recognition accuracy and only have a few example faces per person, gather more data — there are no “computer vision tricks” that will save you from the data gathering process. Invest in your data and you’ll have a better OpenCV face recognition pipeline. In general, I would recommend a minimum of 10-20 faces per person. Note: You may be thinking, “But Adrian, you only gathered 6 images per person in today’s post!” Yes, you are right — and I did that to prove a point. The OpenCV face recognition system we discussed here today worked but can always be improved. There are times when smaller datasets will give you your desired results, and there’s nothing wrong with trying a small dataset — but when you don’t achieve your desired accuracy you’ll want to gather more data. Figure 9: Performing face alignment for OpenCV facial recognition can dramatically improve face recognition performance. The face recognition model OpenCV uses to compute the 128-d face embeddings comes from the OpenFace project. The OpenFace model will perform better on faces that have been aligned. Identifying the geometric structure of faces in images. Attempting to obtain a canonical alignment of the face based on translation, rotation, and scale. Detected a faces in the image and extracted the ROIs (based on the bounding box coordinates). 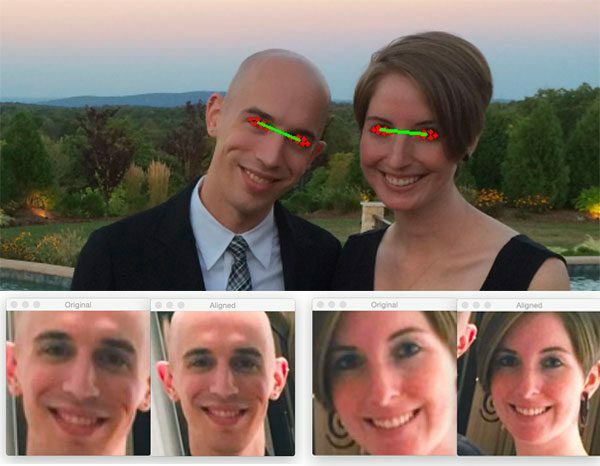 Applied facial landmark detection to extract the coordinates of the eyes. Computed the centroid for each respective eye along with the midpoint between the eyes. And based on these points, applied an affine transform to resize the face to a fixed size and dimension. Be centered in the image. Be rotated such the eyes lie on a horizontal line (i.e., the face is rotated such that the eyes lie along the same y-coordinates). Be scaled such that the size of the faces is approximately identical. Applying face alignment to our OpenCV face recognition pipeline was outside the scope of today’s tutorial, but if you would like to further increase your face recognition accuracy using OpenCV and OpenFace, I would recommend you apply face alignment. Check out my blog post, Face Alignment with OpenCV and Python. My second suggestion is for you to attempt to tune your hyperparameters on whatever machine learning model you are using (i.e., the model trained on top of the extracted face embeddings). For this tutorial, we used a Linear SVM; however, we did not tune the C value, which is typically the most important value of an SVM to tune. The C value is a “strictness” parameter and controls how much you want to avoid misclassifying each data point in the training set. Larger values of C will be more strict and try harder to classify every input data point correctly, even at the risk of overfitting. Smaller values of C will be more “soft”, allowing some misclassifications in the training data, but ideally generalizing better to testing data. It’s interesting to note that according to one of the classification examples in the OpenFace GitHub, they actually recommend to not tune the hyperparameters, as, from their experience, they found that setting C=1 obtains satisfactory face recognition results in most settings. Still, if your face recognition accuracy is not sufficient, it may be worth the extra effort and computational cost of tuning your hyperparameters via either a grid search or random search. In my experience using both OpenCV’s face recognition model along with dlib’s face recognition model, I’ve found that dlib’s face embeddings are more discriminative, especially for smaller datasets. If you take a look at my original face recognition tutorial, you’ll notice that we utilized a simple k-NN algorithm for face recognition (with a small modification to throw out nearest neighbor votes whose distance was above a threshold). The k-NN model worked extremely well, but as we know, more powerful machine learning models exist. To improve accuracy further, you may want to use dlib’s embedding model, and then instead of applying k-NN, follow Step #2 from today’s post and train a more powerful classifier on the face embeddings. Did you encounter a “USAGE” error running today’s Python face recognition scripts? Hi Adrian, I can’t run the code from the blog post. I’m using Spyder IDE to run the code. It isn’t running as I encounter a “usage” message in the command box. There are three separate Python scripts in this tutorial, and furthermore, each of them requires that you (correctly) supply the respective command line arguments. If you’re new to command line arguments, that’s fine, but you need to read up on how Python, argparse, and command line arguments work before you try to run these scripts! I’ll be honest with you — face recognition is an advanced technique. Command line arguments are a very beginner/novice concept. Make sure you walk before you run, otherwise you will trip up. Take the time now to educate yourself on how command line arguments. Secondly, I always include the exact command you can copy and paste into your terminal or command line and run the script. You might want to modify the command line arguments to accommodate your own image or video data, but essentially I’ve done the work for you. With a knowledge of command line arguments you can update the arguments to point to your own data, without having to modify a single line of code. For the readers that want to use an IDE like Spyder or PyCharm my recommendation is that you learn how to use command line arguments in the command line/terminal first. Program in the IDE, but use the command line to execute your scripts. I also recommend that you don’t bother trying to configure your IDE for command line arguments until you understand how they work by typing them in first. In fact, you’ll probably learn to love the command line as it is faster than clicking through a GUI menu to input the arguments each time you want to change them. Once you have a good handle on how command line arguments work, you can then configure them separately in your IDE. From a quick search through my inbox, I see that I’ve answered over 500-1,000 of command line argument-related questions. I’d estimate that I’d answered another 1,000+ such questions replying to comments on the blog. Don’t let me discourage you from commenting on a post or emailing me for assistance — please do. But if you are new to programming, I urge you to read and try the concepts discussed in my command line arguments blog post as that will be the tutorial I’ll link you to if you need help. 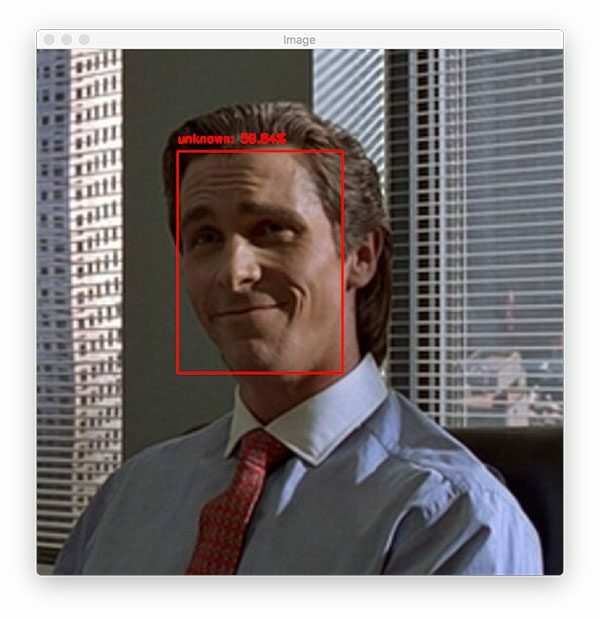 In today’s blog post we used OpenCV to perform face recognition. Since I was married over this past weekend, I used photos of myself and Trisha (my now wife) to keep the tutorial fun and festive. You can, of course, swap in your own face dataset provided you follow the directory structure of the project detailed above. If you need help gathering your own face dataset, be sure to refer to this post on building a face recognition dataset. I hope you enjoyed today’s tutorial on OpenCV face recognition! To download the source code, models, and example dataset for this post (and be notified when future blog posts are published here on PyImageSearch), just enter your email address in the form below! My heartfelt congratulations and best wishes for your future together. And thank you for your wonderful tutorials! Congratulations Adrian on your marriage. Wishing you and Trisha the Very Best in Life ! hey can u help me to figure out this module (Opencv) ,i m getting an error i know its command line argument can u tell me the configuration parts of ur file. Can this be used for detecting and recognising faces in a classroom with many students? Due to the camera angle, some students’ faces may be obscured if the camera is positioned at the front of the classroom. Scaling of faces especially for low resolution cameras (depends on camera placement). Privacy concerns — especially since students/children are involved. What is the maximum number of people i can trai and this system will work accurately? Congratulations Adrian and thanks for the tutorial! Congratulations Adrian for you and now for your wife. My best wishes in this new stage of your lives. I got married in February this year and it feels very good and right 🙂 Nerds like us need great women on our side. Take good care of them and congratulation. Thank you again for this great tutorial on face recognition! I wish you both a happy life together! I read your blog from time to time and enjoy it a lot, I gain a lot of knowledge and ideas from your posts. thank you very much! Regarding your comments about improving the accuracy of the identity, I would like to share with you that I also play a lot with the various libraries of facial identification. Which is very similar to what you’ve shown in this post. I would like to know if there are any significant differences between the two. After a lot of poking around and testing I also came to conclusion that the dlib library gives the best results (at least for my needs), but without GPU – we get very slow performance. I wanted to know if you tried to use the facenet library, which uses a vector of 512D, from my experiments it seems to have the same accuracy as nn4 (more or less), but maybe I’m doing something wrong here. Enjoy with your wife for all life! I wish a green life for you. Regarding the code, I tend to agree with Yinon about the fact that the version that uses dlib seems to work better. In particular this version sometimes finds inexistent faces. Congratulations Adrian and thank you for good tutorial! Very nice postings, and congratulations on your wedding. Wishing you and Trisha all the best in your marriage. Many thanks for your tutorials, they are really great, easy to understand for beginner like me. Congratulations, wish you both the best! Thank-you for this post,ill be attempting it in the next few days, great tutorials always worth a read. I have tried on my big dataset (250 persons with ~30 image/person). But when I run recogization scripts, I got very low accuracy? So I think I should not use Linear-SVM for training on the big dataset. Hi Tran, I believe that you need more training data. Thirty images per class isn’t likely enough. I hope you have a wonderful Honeymoon and life together. Félicitations. Nous vous souhaitons du bonheur, de la joie, de l’amour et beaucoup de souvenirs. / Congratulations. We wish you happiness, joy, love and many memories. Thank you for your tutorial. Could you please point out where non max suppression is solved in this pipeline? There was no non-maxima suppression applied explicitly in the pipeline. Instead, it’s applied by the deep learning based face detector used (which uses a SSD model). Congratulations Adrian! Thanks for your great post. Wish you a happy life together! Wishing you both a lifetime of love and happiness. And thank you for this great tutorial. Hearty congratulations and best wishes to you and your wife. Congratulations Adrian and Trisha. Wish you a wonderful life ahead. If I want to add a person’s face model, do I just need to add that person’s face data set to the dataset folder? Hi Peng — you’ll need a folder of face pictures for each person in the dataset directory. Then you’ll need to extract embeddings for the dataset and continue with the next steps. how do the extract embedding ? Thanks for your course and congrats! Hi Adrian! First of all Congratulations!! I have a question, how can I run this at startup if it has command line arguments(crontab). I would suggest creating a shell script that calls your Python script. Then call the shell script from the crontab. Congratulations to you and Trisha! Many of your readers got a chance to meet both of you at PyImageConf, and you make a great couple! Here’s to many happy years ahead! Thanks Stephen 🙂 And yes, I believe the error is due to the threading bug. How about trying to chage code excution order as below? Congratulations Adrian and Trisha! Happy wedding! I want to use this face recognition method in form of a mobile application. Currently I have used https://codelabs.developers.google.com/codelabs/tensorflow-for-poets-2/#0 article for developing mobile application from tensorflow for face detection. Can you suggest me a direction? Yes, but make sure your data augmentation is realistic of how a face would look. For example, don’t use too much shearing or you’ll overly distort the face. Congratulations Adrian, thank you for the tutorial. I am starting to follow you more regularly. I am amazed with the detail in your blogs. I am just curious how long each of these tutorial takes you to plan and author. Thanks Neleesh. As far as how long it takes to create each tutorial, it really depends. Some tutorials take less than half a day. Others are larger, on-going projects that can span days to weeks. How to apply this model on my own dataset? This tutorial actually covers how to build your own face recognition system on your own dataset. Just refer to the directory structure I provided and insert your own images. Take some time off for your honeymoon and enjoy the best time of your life! have you liveness detection for face recognition systems?its necessary for face recognition systems. I do not have any liveliness detection tutorials but I will try to cover the topic in the future. Hi Adrian, Congratulations on the marriage! Thank you for all the interesting posts! I wonder if Adrian or anyone else has actually combined the dlib landmarks with the training described in this post? It seems to require additional steps which are not that easy to infer. I have successfully created embeddings/encodings from the older posts dlib instructions but when I combine them with this posts training 100% of the faces get recognized as the same face with very high accurace despite my dataset containing several different faces. When I changed up the model I saw that it basically only recognized the first name in the dict that is created and then matches every found face to that name (in one case it even matched a backpack). I spotted a difference between the dicts that get pickled. The one from this post has a text: dtype=float32 at the end of every array but the dlib dict does not have this text. Maybe this is a problem cause? In any case I can’t spot anything else I could change. But I also don’t know how to change that. (Another small difference is that this post uses embeddings in its code and the previous one calls them encodings). Also, in the text above, shouldn’t it be proba > T? Hey Adrian, thanks for the tutorial. We are trying to run the code off an Nvidia Jetson TX2 with a 2.1 mm fisheye lens camera, but the frame rate of our video stream is very low and there is significant lag. Is there any way to resolve these problems? hi adrian, will this algo is useful for faceliveliness detection..
No, face recognition and liveliness detection are two separate subjects. You would need a dedicated liveliness detector. If I were going to use the dlib’s embedding model, but wanting to change from k-NN to SVM how do I do that. You would replace use the model from dlib face recognition tutorial instead of the OpenCV face embedder. Just swap out the models and relevant code. Give it a try! hi Adrian，thanks for your tutorial! I’m trying to replace the resnet caffemodel with squeezenet caffemodel. Simply replace the caffemodel file seems not work. How should I rewrite the code? PS: Congratulations on your marriage! Hey Zong — which SqueezeNet model are you using? Keep in mind that OpenCV doesn’t support all Caffe models. Having attempted the 1st few sections of your post (recognize.py), surprisingly, when I run patrack_bateman.jpg it appears to recognise the photo as “adrian”. Did you actually add more photos to your dataset so that “patrick bateman” doesn’t get recognised wrongly? Yes, I read further down the post that more datasets will eventually lead to much-needed accuracy. But I was just wondering how u got to the part to achieve “patrick bateman’ being ‘unknown’ or unrecognized in your tutorial example. Look forward to your feedback. That is quite strange. What version of OpenCV, dlib, and scikit-learn are you using? Hi Adrian, Thanks for the informative article on Face Recognition. Loved it!!! I have a question on this. What if, I already have pre-trained model for face recognition (say FaceNet) and on top of it I want to train the same model for a few more faces. Is it possible to retrain the same model by updating the weights file. Or how can this be done. Please suggest ideas. Yes. What you are referring to is called “fine-tuning” the model and can be used to take a model trained on one dataset and ideally tune the weights to work on another dataset as well. Always thanks for your wonderful article. I have tested your code for a week. It was working for small dataset(1~2 people face). But when I increased number of people(upto 10), it looked unstable sometims. real name and other name was switched too frequently. to each person’s directory to increase accuracy. still fluctuated output or wrong naming output frequenty. Is there any method to increase accuracy? 1. Once you start getting more and more people in your dataset this method will start to fail. Keep in mind that we’re leveraging a pre-trained network here to compute the 128-d facial embeddings. Try instead fine-tuning the network itself on the people you want to recognize to increase accuracy. 2. 2D facial landmarks in some cases can be used for face recognition but realistically they aren’t good for face recognition. The models covered in this post will give you better accuracy. What happend if any person other than the one in data set entered in to the frame…. The person would be marked as “unknown”. Firstly, I would like to Congratulate you on your wedding though it’s pretty late! I wish to know do you follow any algorithms, kindly mention, if any? I’m not sure what you mean by “follow any algorithms” — could you clarify? Second, instead of viewing the results on my screen, how can I can Output it in a format so I can watch it from another computer. Example, How can I create a stream that I can feed into a vlc server, so I can watch it from another computer on my network. 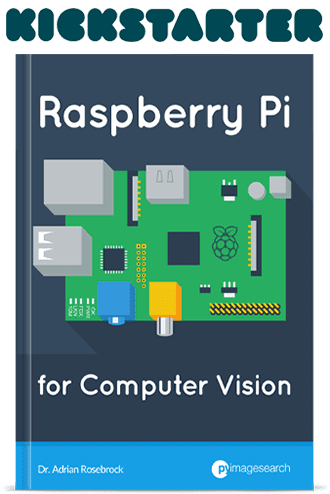 Hey Ray — I don’t have any tutorials on how to display or read an RTSP stream on the Pi but I will be covering it in my upcoming Raspberry Pi + computer vision book. how do we include our own pictures into this to recognize? Refer to the “Project structure” section of the tutorial where I describe the directory structure for adding your images. If you need help actually building the face dataset itself, refer to this tutorial. You are so kind and generous…you must be an amazing human being. Thank you for this tutorial. I cannot wait to use it (I’m still learning some python basics…so not quite ready yet). But I do have a general question for you, which is – well – not off topic entirely, but also something which you may not know of the top of your head, but anyway here goes: Can you guess at or estimate at what camera resolution/focal length one would go from being a “resolved image” to a “low resolution image?” Let’s assume for the sake of the question/answer that it is a cooperative subject. Thanks again, for all you do! Hi Teresa — each camera will have it’s own specific resolution and focal length so I don’t think there is “one true” resolution that will achieve the best results. The results are entirely dependent on the algorithm and the camera itself. AttributeError: ‘NoneType’ object has no attribute ‘shape'”. This code i ran in ubuntu. But in my Mac everything was fine. I used the same version python and opencv. It’s not an issue with Python and OpenCV, it’s an issue with your input path of images. The path to your input images does not exist on disk. Double-check your images and paths. Hendrick, I had the same error but it was a problem with the webcam under Ubuntu. Once I set that up correctly everything worked fine. How can I plot the decision boundaries for each class after train_model? The scikit-learn documentation has an excellent example of plotting the decision boundaries from the SVM. What should I do if the camera recognizes a person who is not being trained, does not appear as ‘unknown’, but appears in the name of another person? I don’t understand this error ” ValueError: unsupported pickle protocol: 3 ” ? Re-train your face recognition model and serialize it to disk. You are trying to use my pre-trained model and we’re using two different versions of Python, hence the error. LabelEncoder seems to be reversing the labels. If you try to print knownNames and le.classes_, the results are reversed. So when you call le.classes_[j], incorrect mapping is done. It seems to be causing misidentification on my datasets. This happens when the list of images are not sorted. After adding sorting of the list of dataset images, it works without problem. By the way, linear SVM seems to perform bad with few dataset images per person. Using other classification algorithms such as Naive Bayes are better suited few datasets. Thank you for sharing your experience, Rico! Is it possible to represent the name in other languages, i.e. Chinese? You can use whatever names in whatever languages you wish, provided Python and OpenCV can handle the character set. Many thanks for your tutorials. Step by step following your instruction, I have successfully implemented 7 tutorials on my RPi. The most fun part is this opencv face recognition tutorial. I train the model by adding my family members. It works pretty accurate at most time but sometimes either your name or your wife name pops up. LOL Anyway, your professional tutorial makes me feel like a real coder, though I am actually a dummy :). Wish you and Trisha a Merry Christmas and Happy New Year. Adrian. Great job. Please tell me how to write a file to the file? Thank. I’m not sure what you mean by “write a file to the file”? Sorry 🙂 Write frame to file. You can use the “cv2.imwrite” function to write a frame to disk. I tried to run this project using opencv 3.3.0 instead of 3.4.2 to avoid lengthy reinstallation… can it work in opencv 3.3.0 ? I would highly recommend you use OpenCV 3.4.2. You can actually install OpenCV via pip and save yourself quite a bit of time. Happy Married life and thanks once again for such enriching article. BTW, you had in one of your articles mentioned a link to the zip file containing the General Purpose Faces to be used with the code. Can you please share that link once again over here? Thanks Tejesh, although I’m not sure what you mean by the “general purpose faces” — could you elaborate? Thanks for the great tutorial and clear site. Its a ton of information. I just started this afternoon after searching the web on how to start, and now i have my own small dataset, and the application is running great. My next step is finetuning with Face Alignment, and put more data in my dataset. Congratulations on already being up and running with your face recognition system, nice job! Are you trying to train a face recognizer to recognize just a single person? Keep in mind that you need at least two classes to train a machine learning model. If you’re trying to train a face recognition system with more than 2 classes and you still received that error then you have an issue parsing your image paths and extracting the person name/ID. I demonstrated how to create a REST API for computer vision and deep learning here. You’ll need to modify the code to swap out the Keras code for the OpenCV face recognition code but the framework is there. Good luck! Thanks alot for these amazing tutorials, i’ve gained lot’s of interest about the computer vision subject and i’ve been enjoying your deep learning crash course. I’m doing a class project for my University, which involves face recognition. One of the requirements of the teacher is the installation of the scikit-learn package.. i’ve noticed that you have used it in this tutorial. Now, my concern is, my teacher also expressed that people that use PyTorch or TensorFlow will get a better grade in their projects. I’m not familiar with PyTorch but i’ve noticed in this tutorial that you do indeed have a PyTorch implementation, am i right? In that case, can scikit learning and PyTorch work together? Am i misunderstanding something about this? Also, what possibly could i add in terms of PyTorch usage that could improve this tutorial that you provided (besides the points that you mention in the end of the tutorial (face-aligment, more data, etc) ? This tutorial leverages a model trained with PyTorch but it’s not actually a PyTorch tutorial. I personally prefer Keras as my deep learning library of choice. 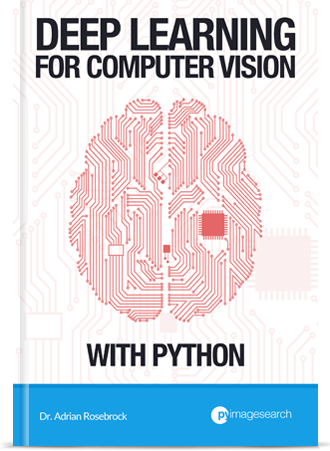 If you’re interested in combining scikit-learn with Keras be sure to take a look at my book, Deep Learning for Computer Vision with Python, which includes chapters using both Keras and scikit-learn. I see, so in this tutorial in particular we are indeed using PyTorch and scikit together, correct? No, this tutorial is using OpenCV and scikit-learn. The model itself was trained with PyTorch there is no actual PyTorch code being utilized. Instead, we are using a model that has already been trained. I found This technique is not gives output accurately ..
please can you have a more accurate technique to recognition??? How you tried my suggestions in the “Drawbacks, limitations, and how to obtain higher face recognition accuracy” section of the tutorial? Yes I followed your Suggestions. I take 70 samples per person. then also wrong match and not match scenarios happened more times. How many unique people are in your database? 70 samples per person is a good number but I’m curious how many total people are in your dataset? i include 3 peoples in my dataset. it cannot display accurately names sometime it display right name but sometime it gives the name of another person. For only 3 people the model should be performing better. Have you used the dlib face recognizer as well? Does that model perform any better? At that point if dlib and the FaceNet model are not achieving good accuracy you may need to consider fine-tuning an existing model. But for only 3 people either dlib or FaceNet should be performing much better. I think there may be a logic error in your code so I would go back and reinvestigate. How could one implement face alignment on this tutorial? I can perform face alignment because of your other tutorial but don’t know what i’m supposed to do with the new aligned faces.. would you save them directly in your dataset? If so, how? Take a look at my face alignment tutorial on how to properly align faces. You would want to align them before computing the 128-d face embeddings. Hi Adrian may i ask why do u resize the image in the first place? High resolution images may look visually appealing to us but they do little to increase the accuracy of computer vision systems. We reduce image size to (1) reduce noise and thereby increase accuracy and (2) ensure our algorithms run faster. The smaller an image is, the less data there is to process and the faster the algorithm will run. So it’s basicly about the dimension reduction feature of scikit-learn? We are reducing the dimensions of the image/frame but I’d be careful calling it “dimensionality reduction”. Dimensionality reduction typically refers to a set of algorithms that reduce the dimensionality of an input set of features based on some sort algorithm that maximizes feature importance (PCA is a good example). Here aren’t removing pixels based on “importance”, we’re simply preprocessing the input image by reducing its size. greetings , i have a question, in the file of labels, their content has only a name per person recognized or are there names for represent each image file? Sorry, I don’t think I understand your question. Could you elaborate? You normally wouldn’t do that. You would detect the face and then perform face alignment before performing face recognition. Hi Adrian, if I previously have many images trained using the SVM, and now I have several additional images (correspond to new people), I need to retrain the SVM by scanning through all 128-d vectors. It would take a lot of time when the number of images is kept increasing. You are correct, you would need to re-train the SVM from scratch. If you expect that more and more faces will be added I suggest you look at “online learning algorithms”. Are you asking me to run the comparison for you? While I’m happy to provide this code to you for free please keep in mind that I’m not going to run a bunch of additional experiments for you. This blog is here for you to learn from, to get value from, and better yourself as a deep learning and computer vision practitioner. I would highly encourage you to run the experiments and note the results. Let the empirical results guide you. Thanks so much for sharing your knowledge, it’s just incredible what you are doing. I was going through your code. When I ran it, the faces which were there in the model were detected accurately. But the faces which were not there were detected wrongly as some one else. I had about 10-12 images of each person. Any idea on how I can reduce the false positives? See this tutorial for my suggestions on how to improve your face recognition model. if i have many many images for many faces and i need to group it automatically by unique ids (grouping all faces to the same user in one unique id), how i can do it? See this tutorial on face clustering. Hi, i tried to build my own face normalized dataset applying face alignment you described in the other topic, but that causes to have all 256×256 pixels “aligned” images ….Applying on that the extraction of embedding I noticed something was wrong because not all the images were processed. Debugging finally I got that the face detection of the extraction step of this module applied on the 256×256-sized images obtained cropping the ROI of the alignment step doesn’t work well. To confirm that I also just modified the routine cropping the ROI for each image from the face detection (without performing alignment) and saving it as new dataset and the extraction step just serialized 1 encoding !!!! Summarizing it seems that a further face detection applied on images already “detected” and saved with the dimension of the ROI doesn’t work. If that I don’t know how to apply alignment to normalize my face dataset. Could you pls help ??????????? I’m a bit confused regarding your pipeline. You performed face detection, aligned the faces, and saved the ROI of the face to disk, correct? From there all you need to do is train your model on the aligned ROIs (not the original images). If only 1 encoding is being computed then you likely have a bug in your code (such as the same filename is being used for each ROI and the files are overwriting each other). You may have a path-related issues as well. Double-check and triple-check your code as it’s likely a logic problem. i wondering if i could use this code on raspberry 3 pi b+ or not ? Yes, but the face recognition will be very slow. You may also need to use a Haar cascade instead of a deep learning-based face detector. 1)hey Adrian how can i self tuned this code can you guide? 2)and also in this code I not get Unknown Label to any unknown person? Both of your questions can be address in this tutorial. How the Self tuning will be done? can you guide me about it. firstly, I am grateful for your work. It has helped me for my Senior Design class project. The way machine learning algorithms usually work (from what I understand) is, it gets trained on dataset allowing the algorithm to set weights. When training is done and we want to predict or classify we simply input the new data into a function which already has weights set. Effectively we do not have to compare the new data to all the previous data. Now, the algorithm for face recognition you described has to look for a face at each frame and then encode it and then compare it to every single encoding in the database. While this is fine for my project since we are only 3 in the group and each has about 50 images in their face directories, it is relatively slow. Yes, I am running the program on a CPU and I understand it can be much faster. However, is there a way of training the machine in such a way that instead of going through each individual encodings (150 in my case) it can go through only 3 where each encoding is going to be some kind of average of one persons face. I know doing the avarage is kind of silly coz of angles and facial expressions etc. but there got to be a way for it work faster. There are a few questions here so let me answer them individually. 1. Yes, many machine learning algorithms are trained on a set of data, any weights/parameters are set during the training, and the model is serialized to disk. Keep in mind we’re doing the same thing here though with just a few caveats. We have a pre-trained face recognizer that is capable of producing 128-d embeddings. We treat it as a “feature extractor” and then train a model on top of those 128-d embeddings. Think of the face embedder as a feature extractor and you’ll see how it’s just the same method. 2. You won’t obtain much of a speedup by training from scratch. The model will still need to perform a forward-pass to compute the 128-d embeddings. The only step you’re removing is the Linear SVM which will be pretty fast, regardless. 3. That said, if you want to train your own custom network refer to the documentation I have provided in the tutorial as well as the comments. I don’t think you understood my question. Perhaps, I did not phrase it correctly. Finding a face on each frame is very similar to what other machine learning algorithms do. What I was asking about is comparing the already embedded face to each and every face encoding in the database. To be precise, the efficiency of the voting system is under the question. I was wondering if it is possible to compare the encoded face from frame to some kind of average encoding of each person in the database. It would be easier to instead perform face alignment, average all faces in the database, and then compute the 128-d embedding for the face. Technically yes, but you’ll need to install dlib on Windows. Please keep in mind that I don’t support Windows here on the PyImageSearch blog. I highly recommend you use a Unix-based OS such as Ubuntu or macOS for computer vision. Thank you so much for your work. Is there a way to add images of new people to an already trained system without running through all already existing images? Yes, you can insert logic in the code to check and see if a face has already been quantified by the model (the file path would serve as a good image ID). If so, skip the image (but still keep the computed 128-d embedding for the face). The actual model will need to be retrained after extracting features. If I want to update a new person into our model, whether this model can not be retrained. Yes, the model will have to be re-trained if you add in a new person. can u please tell me why u passing unknown person images, this model itself should recognize unknown person if it not trained on that person…. The purpose of the unknown class is exactly that — label people as “unknown” if they are not in the training set. You can use an SVM with a linear kernel to obtain your goal. will this post will help to create a project to recognize plants? No, you should use a different type of machine learning or deep learning than that. 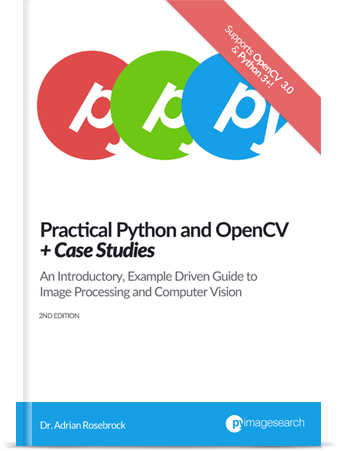 If you’re new to the world of computer vision and image processing take a look at Practical Python and OpenCV which includes an introductory chapter on plant classification. Why linear svm classifier is better than knn classifier? Which method is most effective when we have dataset and many faces? Hey Sari — I cover machine learning concepts this tutorial. That post will help address your question. I am not satisfied with the SVM trained model, can i define my own deepLearning network(using tensorflow) instead of svm to get better result? Have you tried fine-tuning the existing face embedding model? that would be my primary suggestion. I am using openface the same embedder model, how to make tuning ,please tell me. and, is’t possible after extracting the face region i will train the CNN with these regions? I am working for Face recognition feature implementation for Robot to recognize registered office members face. So, in order to recognize face, we can only capture “few pictures (max 5? )” from my office members and i will not able to collect more pictures of each and everyone. With these few samples, we will need to do the face recognition. With this requirement in my hand, i found your previous post (https://www.pyimagesearch.com/2018/06/18/face-recognition-with-opencv-python-and-deep-learning/) on dlib with face_recogtion library and tested with few of my team member face pictures (“aligned” with https://www.pyimagesearch.com/2017/05/22/face-alignment-with-opencv-and-python/), but it is not recognizing correctly as expected (identifying as wrong person). May be my team members are chinese and look similar? So, here i need your advise and suggestion on which one to use? Should you use this post application (OpenCV Face Recognition)? Or your previous post with dlib? for my above development scenario? Please suggest. And regarding porting train_model.py script on dlib based face recognition application, i have copied recognizer.pickle and le.pickle from this post to other application with dlib on the same output directory. And also modified the train_model.py with “encodings” text to look for encodings.pickle file and ran the train_model.py script. But after this training model script, i see still the face recognition is not so accurate as expected for Robot. Please correct me if i did anything wrong here. Please guide and help on this. Thank you. I would try using dlib’s embedding model and then try training a Linear SVM or Logistic Regression model (from this post) on the extracted embeddings. I’ve found dlib’s model to be a bit more accurate. Thanks a lot for such an informative post. I have followed the procedure to train my own set of images and recognize. I had put 6 images of a person in the folder dataset > name of the person. My question is if the network cannot work effectively for the new set of images, how does it classify you or trisha for just 6 images ? It’s not that the network will “never work” with a small image dataset — it’s that larger image datasets are always preferred for higher accuracy and reliability. I have done this project, and done it using webcam. Now when the frame window is opening it is giving an fps of 0.34 to 0.40 and it is lagging very much. Due to this we are not getting accurate output. The RAM consumption during this process is 92%. So please do tell us how to resolve this issue. Is this the problem of webcam or raspberry pi? If you’re trying to perform face face recognition on the Raspberry Pi you should be following this tutorial instead. I have to use Deep learning classifiers instead of linear support vector classifier …how it can be done? Hi Danny — you’ll definitely want to read this tutorial where I share my suggestions on obtaining higher face recognition accuracy. I was wondering whether the dlib pipeline which you wrote in another post, takes care of face alignment or do we have to incorporate it? No, you need to manually perform face alignment yourself. Refer to this tutorial on face alignment. I have addressed that comment in the comments section a few times, please give the comments a read. Kindly take the time to read the tutorial. I cover your question in the “Drawbacks, limitations, and how to obtain higher face recognition accuracy” section. Thank you so much for this guide! My question is, do I need to input the names of the folders into the code where it says “name” or will that assign itself automatically? For example, in lines 47-53, can I leave it as “name” or should I say “adrian = imagePath.split(os.path.sep)[-2]” instead? I’m also having difficulty setting everything up, I’m new to OpenCV but I believe I have version 3.4.7. is this okay or should I get 3.4.2 instead? Thanks in advance! You don’t have to change the code, just update the names of the directories and the images inside each of the directories. Is it possible when the unknown person is came ,it detects unknown and generating Id for him/her. If again same that unknown person will come,It have to show previous generated Id . Did you had test the LightenCNN face recognizition model(https://github.com/AlfredXiangWu/face_verification_experiment)? How about it compared to OpenFace,and dlib’s embedding mode? I have not tested that model, I am not familiar with it. Thanks a lot . it is really helpful. It worked well. Hi, Adrian I am a fan of your blog. Your blog had really helped me learn OpenCV a lot. From the previous tutorial, DLIB is used for face detection and k-nearest neighbor is used for a face recognition/classification. While in this tutorial OpenFace is used for face detection and SVM is used for face recognition and classification. From what I had experience from your code, face detection is more accurate using DLIB while SVM is better in the classification of faces. So, now I am planning on using 128-d embeddings generated from DLIB and use SVM for classification. My question is if I used this method, will the false positive still occurs if I will need to recognize the 1000-10,000 of people? Because I just wonder how the API like AWS, Microsoft Azure can get really good accuracy despite so many people is using their API. For 1,000-10,000 people you should really consider fine-tuning the model rather than using the pre-trained model for embeddings. You will likely obtain far better accuracy. Thanks for your reply Dr Adrian, what does fine-tuning the model means? Does it mean we need to retrain the K-NN or SVM model for the classification process or we need to retrain a custom model for face detection? Because it seems like dlib doing a good job detect face inside the image. No, fine-tuning the model means taking the existing model weights and re-training it on faces/classes it was not originally trained on. This post covers fine-tuning in the context of object detection — the same applies to face recognition as well. Thanks Dr Adrian. I will check on your post. I had googled a bit and found out that it seems to be related to Deep Transfer Learning (DTL).